The Norwich Terrier has many of the characteristics of a true terrier. It is a breed that is full of energy and always ready to explore. The Norwich Terrier is also known for being an alert and self-sufficient companion, with the capacity to be defiant at times. It is best suited for the person looking for a dog that loves to explore and that has a healthy sense of humor. 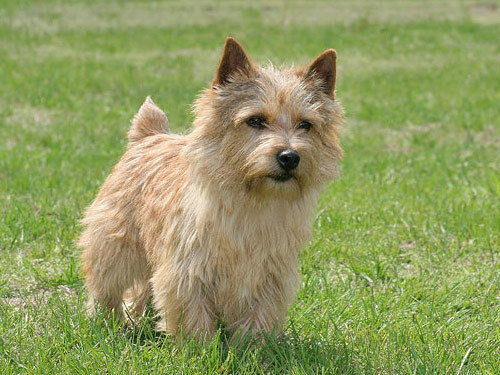 The Norwich Terrier requires daily physical exercise in the form of walking or running. The combination of a run with an opportunity to explore outdoors is ideal, but must be done in a safe and secure environment. The Norwich Terrier is both an indoor and outdoor dog. It is suited for living inside of the home, but can be kept outdoors during the day as long as the climate is temperate or warm. The coat is a wire coat and needs combing maintenance one to two times per week. The Norwich Terrier also needs dead hairs stripped a few times annually. The major health concern or the Norwich Terrier is known as CHD, or Canine Hip Dysplasia. This is a disease that affects the development of the hipbone with a ball and socket that do not function properly. Minor health concerns for the Norwich Terrier include allergies and seizures. There are several diseases and conditions that are often seen in the Norwich Terrier, which include patellar luxation, cheyletiella mites, deafness, and cataracts. It is suggested that the hips and knees of the Norwich Terrier are regularly tested. The average life span of a healthy Norwich Terrier is 13 to 15 years. For a long time in the early years in England, short-legged ratting terrier breeds were esteemed and desired. In the 1880s, before the Norwich Terrier was known as a separate breed from the Norfolk Terrier, it became a trend for students at Cambridge University to have these dogs as pets. Initially known as a Cantab, these small terriers later became referred to as Trumpington Terriers. An individual Trumpington Terrier by the name of Rags arrived at a stable near Norwich during sometime around the early 1900s. Rags quickly gained a reputation as a ratter and the sire of modern Norwich and produced numerous offspring. One of the male offspring made its way to America and became a likable representative of the Norwich Terrier, which grew the breeds popularity. This male offspring was owned by a man by the name of Jones, and for this reason, many still refer to the Norwich Terrier as the Jones Terrier. The Norwich became recognized by the AKC in 1936 as an established breed. Up until 1979, both the prick-eared and the drop-eared varieties were included in this recognition but at this time the drop-eared variety became recognized as its own breed known as the Norfolk Terrier. The Norwich Terrier is a highly competitive show dog, regardless of its shorter legs then most competitive terrier breeds. As a pet, the Norwich Terrier only finds a modest amount of popularity.